Theodore Crawley, class president; and Douglas Kastanotis, class treasurer. Back row, Roland Tyler, class executive, and Dennis Skeades, class vice president. Diplomas were awarded to 104 students. The First graduation program at the new Lynn Vocational and Technical Institute was conducted this morning when diplomas were presented to 104 graduates during exercises in the school cafetorium. The diplomas were presented by School Committeeman Robert E. Webber. Guest speakers were State Rep. Walter J. Boverini and George A. McKenna, senior class secretary and valedictorian. Included in the graduating class were 19 girl students who completed the dental assistant course. This marked the first time in Lynn educational history that girls have been awarded diplomas from a vocational school. The 85 boy graduates began their vocational education three years ago in the former Trade High. The new school which opened last September, will have larger graduating classes in the future years owing to an expantion not only of facilities but of courses. Next years incoming sophomore class will number nearly 500 students. The featured speakers were introduced by James A. Pelley Sr., director of the school. Rep. Boverini, a member of the joint Legislature Committee on Education, told the graduates he was proud of Lynn's accomlishments in the field of vocational educational. He added that the present graduating class was equipped with "the finest education that any generation in history has ever obtained" and "that you face no single problem that has not been met and surmounted by many of the classes that preceded you." McKenna said that "vocational education is one means of enabling young people to move from school to a productive and more satisfying adult life." He noted that with a new vocational school, Lynn would now be better able to train many of its young people in a large number of trades. He cited his own case saying that he had a job upon graduation without the need of a training program. The class procession was led by the class officers, Theodore D. Crowley, president; George A. McKenna III, secretary; Dennis Skeadas, vice president and Douglas M. Kastanotis, treasurer. The class advisor was Thomas Brady. The school chorus under the direction of Ralph Jamieson, presented a musical medley. The accompanist was Martin Healy, director of audio-visual education in the Lynn school system. The musical program was under the direction of Clifford W. Webber, supervisor of vocal music in the Lynn school system. Richard Allen Bowdren, Theodore Dennis Crowley, Rollins Aaron Kempton, John Ray Keraghan, Raymond Girard LaPointe, John Philip LeBlanc, Robert Edward McLaughlin, Daniel James Moriarty, Robert Charles Newbury, Wayne Robert Reynolds, William Alphonse Young. Dianne Charlotte Bickford, Virginia Narie Birchett, Jacqueline Carmella Bourque, Paula Ann Burtman, Elaine Rose Carroccino, Joan Edith Corporon, Judith Ann Cotter, Donna Marie Desilets, Nancy Jean Howard, Anne Marie LeBlanc, Patricia Bridget Maher, Joanne Mamos, Catherine Ann Roy, C. Elizabeth Wallace, Patricia M. White. Delores Harris, Louise Pelletier, Bethany Scanlon, Kathleen Young. Glenn Russell Anderson, Barry William Berman, Ronnie Lawrence Bonnevie, Robert Joseph Bowser, Warren Howard Brown Jr., Kenneth Burke, Wayne Allen Johnston, Douglas Michael Kastanotis, John Michael Krajewski, Danny Joseph LeBlanc, David William Mair, Richard Michael McAdam, Robert Francis Page Jr., Robert Gustav Seaburg, John Peter Seward, Steven Alan Shaw, Thomas Edward Stanchfield, Richard Leo Wright. 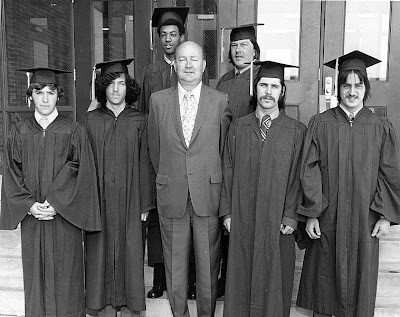 Timothy Bradford Bogart, Patrick John Gordinas, Gary Wayne Grant, Dennis Michael Muldoon, Michael Joseph Paradis, Dennis George Skeadas. Dale William Beaver, Michael James Cormier, John Joseph Crowley, Michael James Hutt, Walter Henry Milliken Jr., John Sebastian SanFillipo Jr., Joseph Gerald Shackleton. Michael Chritopher Bonitto, Richard Allen Catalano, John Leonard Carbone Jr., Steven Allen Colby, David Jonathon Conha, James Michael Cotter, Jeremiah D. Costantino, Joseph Walter Fernald, Robert Lester Fintonis, Harry Wickson Glover, Edward Francis Heuston, Ernest Thomas Hoy, Francis Xavier Hunter, Joseph Michael Melcher, Kevin Michael O'Leary, Bruce Edward Sampson Jr., Richard Thomas Surette, Ralph Edward Trull Jr., Richard Michael Voci, Eddie Ward, Darryl Anthony White. Robert Lansing Jr., John Eugene Deschene, Charles John DiPerri Jr., Steven Paul Hyde, Michael John Mahoney, Ronald Louis Plourde, Edwin Roy Sewell, Carl Schultz, Credell Wallace, George James Wright. A total of 14 graduates of the Lynn Vocational and Technical Institute received awards for proficiency in classroom and shop studies during exercises this morning at the school cafatorium. Joseph G. Shackleton, son of Mr. and Mrs. Joseph H. Shackleton, 24 Osborne St., and Dale W. Beaver, son of Mr. and Mrs. Kenneth R. Beaver, 31 Lexington St., were winners of the awards presented by Local 142, American Federation of Technical Engineers. The awards consisted of drafting equipment and handbooks. George A. McKenna III, son of Mr. and Mrs. George A. McKenna Jr., 10 Savoy St., received the General Electric Managers Award in the amount of $200. Winners of cash prizes presented by the Institute of Electrical and Electronic Engineers Inc., were Richard V. Caparella, son of Mr. and Mrs. Mario Caparella, 550 Lynnfield St., ($120): Joseph Shackleton, ($90): David W. Mair, son of Mr. and Mrs. George G. Mair, 22 High Rock Terr., ($60): Ronnie L. Bonnevie, son of George A. Bonnevie, 243 Maple St., ($35) and Warren H. Brown Jr., son of Mr. and Mrs. Warren H. Brown Sr., 76 Johnston St., ($20). Raymond LaPointe, son of Mr. and Mrs. Paul LaPointe, 23 Stone Place, was the winner of the Lynn Teachers Union Award, a cash prize of $150. Richard Caparella was thr winner of the Lynn Teachers Association Award, a cash prize of $150. A $100 savings bond donated by the Fairview Machine Co. of Lynn was awarded to Robert L. Fintonis, son of Mr. and Mrs. Gerald Fintonis, 73 Center St.
Michael J. Paradis, son of Mr. and Mrs. Leon Paradis, 67 Verdmont Ave., was the winner of the $100 cash prize donated by D.M. Products and Empire Paper Corp.
Patrick J. Gordinas, son of Mr. and Mrs. Joseph F. Gordanas, 71 Oakville St., was the winner of the $50 savings bond donated by the firm of Carter, Rice, Stofts, and Bement. Prizes of welding helmets donated by the Middlesex Welding Co. were awarded to George J. Wright, son of Mrs. Harriet L. Wright, 391 Chestnut St., and Steven P. Hyde, son of Mr.and Mrs. Edwin A. Hyde, 175 Bellevue Road. The Jay and Jeffery Cohan Award in the amount of $50 was presented to John Seward, son of Mr. and Mrs. Patrick J. Seward, 29 Witt St.
Two Plaques donated by the facility of the Graphic Arts department were presented to Michael Paradis. 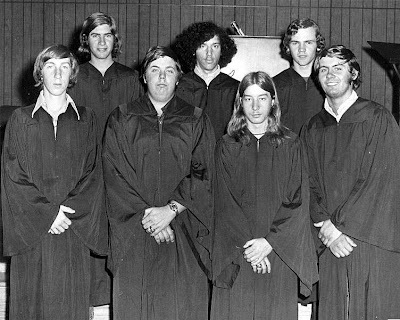 Link to the class of '72 Scroll Photo.